Transporters in Sikkim are on an indefinite strike after miscreants vandalised and looted Sikkim bound trucks near Siliguri in West Bengal. He said the association decided to go for indefinite strike from yesterday after members of the association reviewed the June 28 incident of Siliguri when the driver of a truck was beaten up, his truck vandalised and looted by a mob. “After proper fact finding we took the decision to go for indefinite strike,” Sherpa stated. 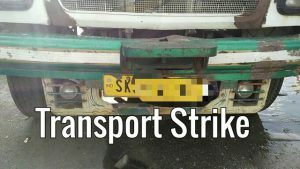 He said the strike would continue till the West Bengal gives an assurance of providing security to Sikkim vehicles, so that no vehicle is attacked. “There are few trucks that have plied to Siliguri due to lack of information or delay in availing information so we appeal the West Bengal authorities to make proper arrangements for their safe passage to Sikkim from Siliguri. He also informed that they had submitted a memorandum to the Sikkim chief secretary, home secretary, transport secretary, DGP, requesting them to take appropriate step and speak to their counterparts in West Bengal in smooth operation of the highway. We also appeal the Government of India to look into the matter seriously as Sikkim is a border state and NH10 is the only lifeline of the state. “Arrangements must be met to keep the highway open. We also demand the West Bengal police arrest the culprits who attacked the truck driver on June 28 at the earliest and take stringent action so that no such act is repeated in near future”, he said. Sikkims ruling party the SDF on June 20 extended its support to the “democratic demand” for a separate Gorkhaland. The SDF had also appealed to the Centre, the West Bengal government, the people of Darjeeling and the political parties in the hills to ensure that the National Highway which connects Siliguri-to-Gangtok) and which passes through the Darjeeling and Kalimpong districts was left open as it was the “lifeline” of land-locked Sikkim. The Sikkim Assembly had, on March 29, 2011, passed a resolution in favour of Gorkhaland.